One of David Soane’s best-known start-up companies, California-based Nano-Tex Inc., treats fabrics with a special polymer so they resist oily stains. The serial entrepreneur’s latest venture, Soane Energy LLC, deals with a different kind of oil: The Cambridge-based start-up aims to make crude oil production less damaging to the environment. Soane is a low-profile presence on the local start-up scene: A former chemical engineering professor at the University of California at Berkeley, he moved here five years ago. In 7,500 square feet of laboratory space near Alewife, he is cultivating Soane Energy, along with two other start-ups, one of which aims to make the fizz in soft drinks last longer. An earlier Soane company, Silicon Valley’s Aclara BioSciences, went public and was later acquired for about $180 million. Oil sand looks just like you’d expect: Imagine potting soil suffused with a cup or two of motor oil. Extracting oil from it is a complicated process - and one that produces plenty of waste. “To produce one barrel of synthetic crude oil from the sands, you need nine barrels of water and about 1.4 metric tons of the sand,’’ Soane explains. One nasty byproduct is what the industry calls “mature fine tailings’’ - a mixture of sand, clay, water, and traces of oil. Tailings get poured into massive ponds, which now cover about 50 square miles of Canada’s oil sands region. The equivalent of 600 Olympic swimming pools of new tailings are added every day. You wouldn’t want to swim in one of these so-called tailings ponds: Last April, it was reported that 1,600 ducks had been found dead in a pond created by Syncrude Canada Ltd., the biggest producer of oil from Canada’s oil sands. Soane has developed two polymers he thinks can help clean up the ponds. 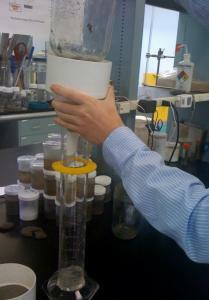 One polymer attaches itself to the fine particles of clay in the waste water, and another attaches itself to the sand. Then, the two polymers bind and the heavy sand serves as a kind of anchor that drags both particles down to the bottom. In a demonstration at Soane’s Cambridge lab, it looks almost like a magic trick: In a few seconds, a jar holding dark sludge separates into clear water on top and a fairly solid layer of clay, sand, and the two polymers on the bottom. The water can be recycled to process more oil sands, and the solids can be put back into the empty hole in the ground the oil sands were taken from in the first place. “It makes the ground solid enough to drive on, or you can replace the topsoil and grow things on it,’’ says William Ware, Soane Energy’s chief technology officer. It sounds wonderful, but the various companies working in Alberta’s oil sands region haven’t started using the process - though some have seen Soane’s demo. Soane Energy could be helped by a new directive from the Energy Resources Conservation Board of Canada, which will require oil producers to do more to clean up their tailings ponds. But the company will have to compete with other methods, none of which is widely adopted yet. “Because of the new directive, there’s a tremendous amount of work underway at the research stage, and in field demonstrations, to manage these tailings in a different manner,’’ says Dave Sego, a professor who heads the Oil Sands Tailing Research Facility at the University of Alberta.